Check out our gallery of images of Seattle at Night. UPDATE - 12 January 2008 - We've added five new reviews for Chez Shea, The Local Vine, Quinn's Pub, Matt's in the Market and Steelhead Diner. Seattle is in the far northwest corner of the lower 48, well off of the NY-LA axis. This makes it rather remote, and for a long time Seattle was a sort of backwater, mainly noted for rain and Paul Bunyan jokes. Over the last 10 or 20 years, Seattle has been moving out of the shadows and has become a rather good food town. It still has some rain, but the summers, when most of the tourists see it, there is plenty of sun, and the economy has shifted from logging to technology and trade. The northwest corner is a bit behind the great food centers of California, but the urban sophisticates have their Imperial and Napa Valleys out in eastern Washington. Maybe you can't get Vidalia onions out here, but they have their own Walla Wallas, which are just as good or better. 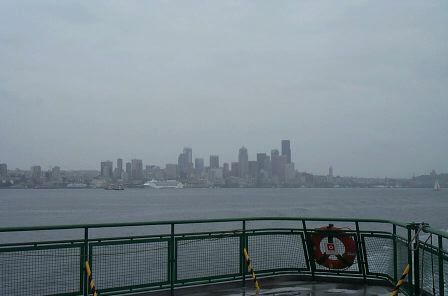 Also, Seattle is a city on the water. The local fish make it to the table in short order, and the arrival of Alaskan Copper River salmon each year is an event well celebrated. Surprisingly, for the Pacific Rim, Seattle is not a great town for Chinese or Japanese food, but, this too is changing. Poppy - great concept, mediocre execution; Ignore the hype. Quinn's Pub - more than just a neighborhood pub; This is was meat city. - Don't waste your time.